Howdy! So, I'm back. I posted a few days ago, a creative challenge for you: to simply note and photograph 5 things a week, to document those precious moments in your life. I also stated that this challenge would begin on August 1, 2015, so you would have time to create a special book to keep your documented blessings. 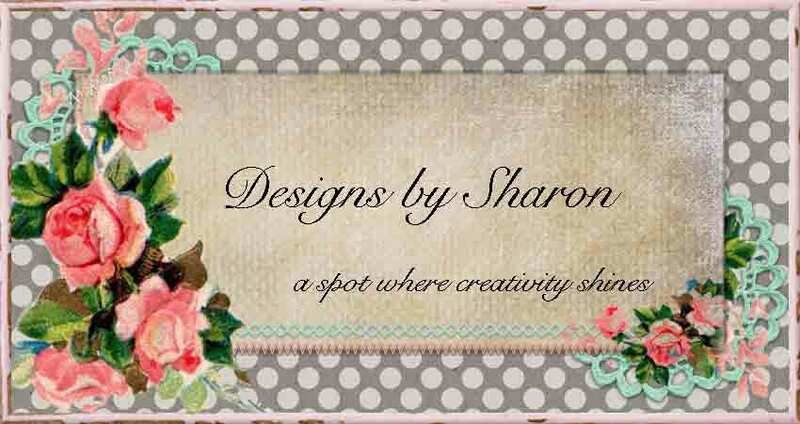 I set out into my craft room today, to create my book. And I want to share it with you. I used the current sketch from Mojo Monday to help get the creative juices flowing for this project. 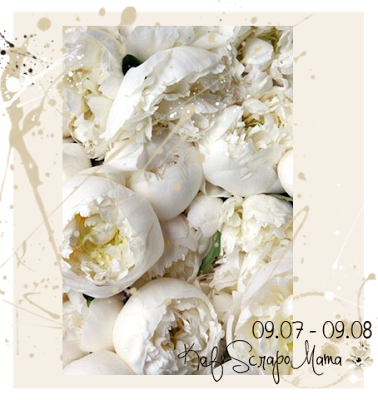 I am also entering the creative challenge over @ Scrap-Pygovka. Their challenge is make a cover/book. 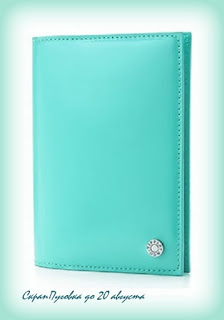 Something that holds documents/pages. Also, last but certainly not least. I am entering the challenge over @Kafe Scrapo Mama. These ladies are super talented and very inspirational. I do encourage you to see what they have created. 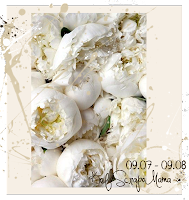 Their challenge is to add one mandatory white flower to your project, and no other requirement. Cover: The pink text paper is from Webster's Pages, and the floral paper is from Tilda. I used a big white Prima Marketing blossom. 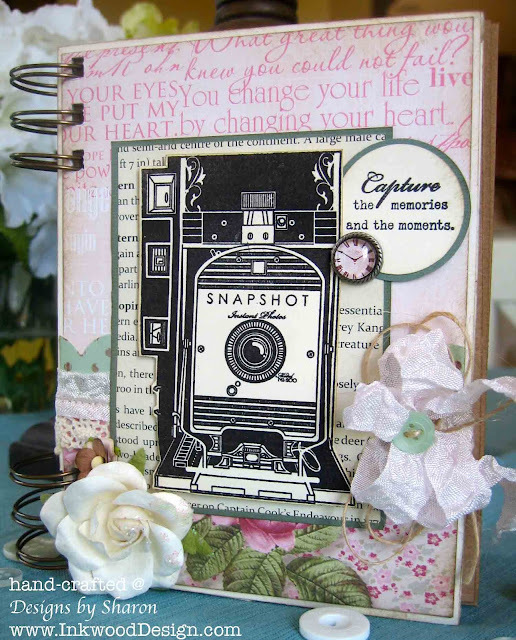 I stamped the 'vintage' camera in black ink, onto very vanilla card stock, by Stampin' Up! and fussy cut. I used foam tape to adhere the camera to a text print paper. (The camera and sentiment both come from Shutter Bug stamp set by Paper Trey Ink.) The clock brad comes from LemonCraft. I added a scrap piece of that beautiful pale blue-green and brown polka dot paper (Stella Rose) to the seam where the two pattern papers meet. I also added some crochet trim and pale pink seam binding, and machine stitched them to the cover. I added a multi-loop bow to the cover, and tied on an aqua mist vintage button, by Paper Trey Ink. I added a double bow of the kraft twine under the seam binding bow. The tiny brown paper blossom was tucked in just above the big white blossom. Inside front Cover: I used pattern papers from the Stella Rose collection and machine stitched them to the front cover. I added an ATC card from the Coffee Break collection by Prima. I just love how positive the sentiment is. Inside back Cover: I used a large scrap piece of the blossom paper I used on the front cover, by Tilda. 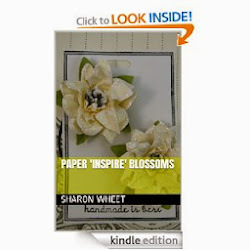 I just love the tiny blossoms, and the vintage look of this paper. I added a long banner piece cut from the same Websters Pages paper. I used a photo corner punch to create the banner end. I added some machine stitching to the top of this banner piece. I added another of the Coffee Break ATC's. I love this piece. A coffee cup, a vintage typewriter in that gorgeous aqua blue color and some beautiful home-grown roses. Back Cover: I used a scrap piece of the pink patten paper from the cover, by Webster's Pages. I love the different fonts in white, and the scallop edge. Very beautiful! 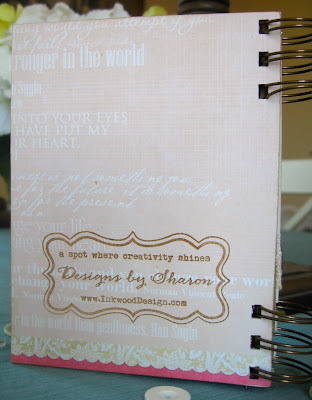 and I stamped my 'brand' on the back in Baked Brown Sugar classic ink, by Stampin' Up!. If you noticed, the pages inside are blank. That way, I can decorate them as I want, as I go. Because I am not sure on how I will display my photos. And I wanted to use my favorite kraft card stock on the inside. I used my Bind-It-All, to create the holes and connect the spiral rings to my book. I used 1" antique gold rings for this book. Well, thank you for looking. I hope you play along with my challenge. 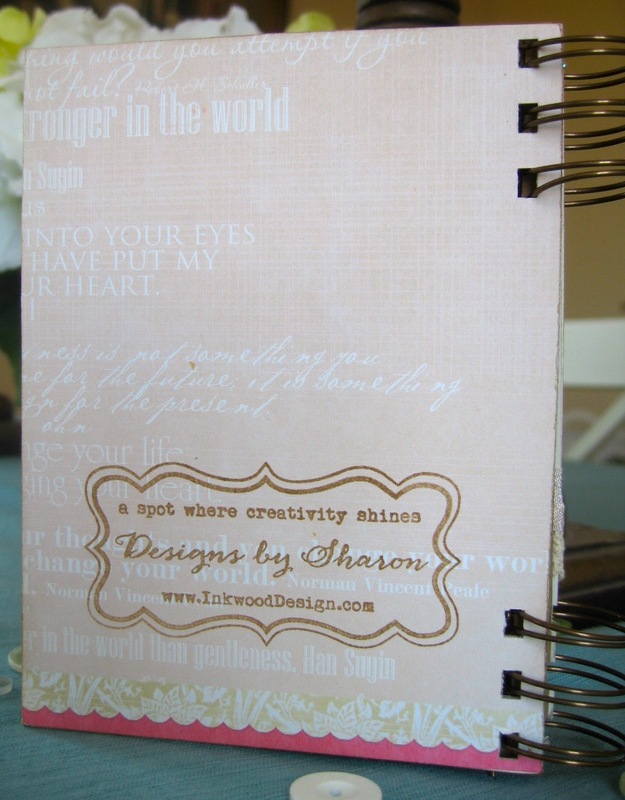 This creative 5 x 5 challenge begins August 1, 2015. All you need to do, is take 5 photos a week, capturing the moments that make your life special, memorable, and uniquely YOU, and write one minute for each photo. Either share your photos in social media, a blog, or a journal. I believe that a majority of our lives should be 'off record'. And so, I will share with you, HERE on this blog, 2 of my weekly photos. This is so fabulous! Love that vintage camera image. Thanks for playing along with Mojo Monday! oooooooooh this awesome project!!!! thank you that you are plainig us at KSM!!! !